My first reaction to the DISTURBED was one of surprise. Roto Grip situates it in its HP-3 Line (hook potential of 3 out of 4). But in comparison to the HP-4 Line the DISTURBED doesn't strike me at all as a step down. I wouldn't call it tame by any means. Its guts - the Middle Roll 70™ core - is brand new in the DISTURBED and the core's name is perfect indication of the way the ball performs. It gets into a really good strong roll through the midlane. It's change of direction down lane is a controllable smooth arc and it has really good continuation through the pins. The grit on the DISTURBED is the 66MH™ solid reactive coverstock. True to what the MH grime indicator implies, I have found the DISTURBED to churn through medium/heavy oil patterns very effectively. I personally think the 66-point coverstock rating is a fooler! When compared, for example, to the 77-point rating of the hybrid cover of the DEFIANT SOUL, the numbers would lead you to expect the DISTURBED to be noticeably weaker. For me the overall hook of the two balls is pretty darn similar. The significant difference between them - which makes each of them uniquely good - is the shot shape they create. The DISTURBED makes a smooth arc and the DEFIANT SOUL is more angular with "easier" length. Roto Grip describes the coverstock on the DISTURBED as "providing good traction…when the Micro Bite cover [read DEFIANT solid] is just too much." In my opinion, there's just no good reason at all to compare the DISTURBED to the original DEFIANT - the DISTURBED is heads and tails a better ball! Based on these observations, for me the DISTURBED is the perfect weapon when it's more effective to try to plow through a pattern with closed angles rather than trying to slow hook around the corner/end of a pattern down lane. A great instance of that for me was at this year's USBC Masters when the pattern played much, much tighter on the lower level at Brunswick Carolier Lanes. I've also found that with the right layout and surface the naturally smooth arcing motion of the DISTURBED gives the ball some versatility and usefulness on medium volume patterns as well. That's what made it the first ball out of the bag for a few of us trying to blend out the edge of the pattern at the beginning of the Team Event at this year's USBC Open Championships paving our team's way to 3312 and what looks like it'll be close to a top 50 finish. I've drilled two DISTURBEDS now. The first is stacked under the ring finger, a layout which in other equipment over the years has provided a good smooth reaction for me with just a little extra pop through the pins. At the Masters this year that layout wasn't quite giving me enough length to reach the end of the pattern the right way and in the right place so we drilled another with a favorite old layout of mine (Pin about 1 inch above the ring, 4.25 from PAP, with about a 60° drilling angle). That did the trick. It was clear to me again in that moment that Roto Grip had designed yet another top quality, reliable ball that does what you expect it to do when you lay it out a certain way. After several months in my bag now, the DISTURBED has also proven itself effective in some situations that I wouldn't have predicted simply with some surface tweaking. The 66MH™ coverstock is one that I find easy to manipulate up or down to get the effect I'm looking for without a whole lot of guesswork or trial and error. 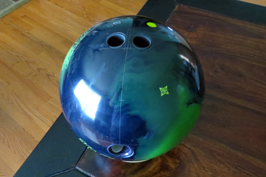 Long and short, the DISTURBED can be a great tool almost no matter what you're bowling on. 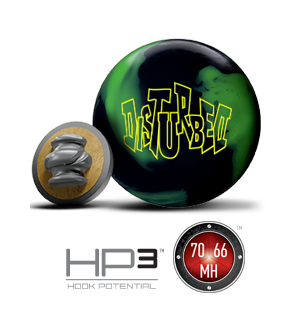 If you're a league bowler in a center that most often feels a little on the slick side for you and you feel like you need a little more good roll, get yourself a DISTURBED. You won't be disappointed!